PSENcode are used to monitor the position of guards in accordance with EN 60947-5-3 and also for general position monitoring. Thanks to integrated evaluation and standard interfaces, PSENcode is open to products from other manufacturers. The coded safety switch fits perfectly into your environment and can also be used to upgrade your plant. For safety gate monitoring, PSENcode - both in the compact and the large design - offers the highest level of manipulation protection thanks to RFID technology: In the unique, fully coded version, there is only single actuator that the sensor accepts (key lock principle). 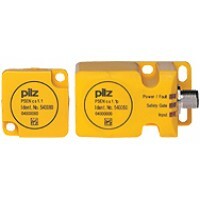 Thanks to series connection with additional sensors such as PSENcode, PSENini, PSENslock, PSENsgate up to PL e of EN/ISO 13849-1 you receive a highly economical and at the same time safe solution. One version of the coded safety switch PSEN csx.19 is suitable for safe position monitoring. In this case PSENcode safely monitors up to three positions, which can also be safely differentiated by the sensor. Diagnostics are quick and user-friendly via LED display, whether you use the compact or the large design. Thanks to the connection type (M12 connector, 5-pin), the new PSENcode fits perfectly into any system environment.